Brahim is a rock star! I’m here in Morocco for the very first time (and it will not be my last!!) all the way from the Big Apple: New York City. The highlight of the trip has been the days spent with Brahim and his amazing team, Mohamed and Omar. We saw incredible sights, learned many, many things, always feeling safe and good like one of the family. 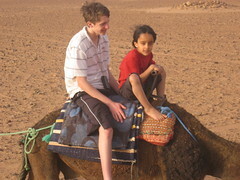 When I decide to come back to Morocco, the very first thing I will do is email Brahim – and I’ll plan the trip from there. See You in NYC Brahim; I am a great guide there. Thank you for the amazing trip yesterday. We went by 4×4 wheel drive to Chigaga to see the sun go down and the moon rise in the Sahara. It was very beautiful and will be remembered in our heart and mind. Brahim is a very nice guide who can tell about the surroundings and is very involved with the well being of the population. Thank you again for a wonderful trip. Laura and I Had such a great experience to bring in the New Year! Mohamed’s tagine is delicious. (But I will not say if it’s better than Brahim’s), and the sand bread from Mobarak was amazing. We wish you only the best of luck in the New Year (inch Allah of course) health and happiness and makai mushkil. Marc and Laura New York USA.